This petite beauty proves that great things often come in small packages! Gorgeous 2" blooms striped in red and white appear on sturdy 8-12" stems to give early to mid-season gardens a pop of stunning color and tons of natural style. Very easy to grow and a reliable bloomer, Peppermint Stick makes an amazing showing in large plantings either in a naturalized area or more confined border or bed sites. In fact, it requires only a sunny, well-drained spot in which to thrive. Perfect for adding color and flair to a mixed container garden. The showy flowers also look spectacular against the natural hues and shapes of a rustic rockery. Peppermint Stick is an all-around garden winner! 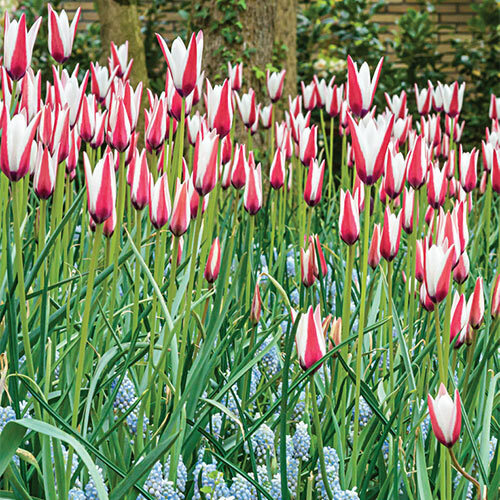 One of the best tulips for perennializing.